Why Laser Cutting for Sheet Metal Fabrication? Laser cutting saves time and money. A highly precise, highly automated process, laser cutting can eliminate the need for additional machining and finishing on many fabricated parts and products. It is a more precise and energy efficient process than many other types of industrial cutting. Unlike traditional cutting machines, laser cutting quality does not rely on parts that can wear during the cutting process, so stays consistent and precise throughout the job. Laser cutting also allows for fabricating more complex shapes faster than many other cutting methods, including small diameter holes and other cuts with good edge quality. The ENSIS AJ 3015 AJ fiber laser features the ENSIS-3000 oscillators that produce a very high quality beam tuned specifically for sheet metal fabrication. Fiber optic laser cutting has advantages over CO2 laser cutting equipment, particularly in thin metal application where it runs three times faster on average than a CO2 laser doing the same job. The fiber optic laser cutter also cuts ferrous steel up to nearly 1 inch thick (depending on quality of material). For mild steel processing, it is comparable to that of conventional high power CO2 lasers. With Amada's "variable beam control" technology, the laser beam is automatically and continuously set to match the thickness of the sheet, allowing for clean, consistent cuts and higher quality finished parts. The process is constantly automatically monitored for any cutting defects to ensure consistent cutting and finished products. The FO MII 3015 NT allows high-speed processing of both thick and thin materials. This laser cutter features Spatter Free Pierce (SFP) for cleaner piercing of thick materials. It is fully automated with load and unload capabilities and can cut various materials at thicknesses ranging from 1/32 to 1 inch with unparalleled precision. 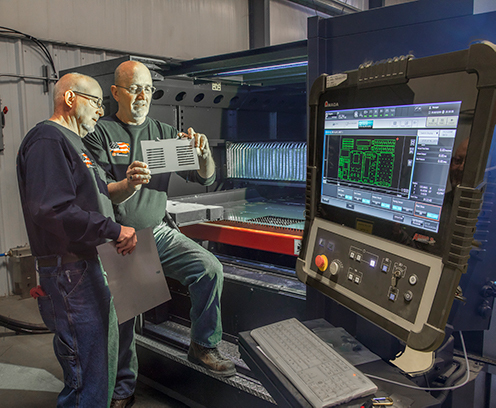 With the capacity of two top quality laser cutters outfitted with automated load/unload capabilities for even greater effeciency, CB Fabricating offers oustanding quality, customer service, and turnaround times for your sheet metal laser cutting projects.